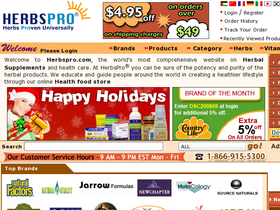 HerbsPro.com is the leading online retailers of herbal supplements, vitamins and health care products. Their line of bestseller natural and herbal products include Dog Gone Pain,Topricin Cream, Clear Tinnitus, D Mannose, Squalane Skin Oil, Reduced Glutathione, Herbagreen Tea, Hep Forte, Healthy Trinity, Mother's Milk Tea, Almased Multi Protein Powder, Organic Life Vitamins, Chanca Piedra, Silver Biotics and lots more. HerbsPro.com is your one stop online store for natural herbs, herbal supplements, herbal remedies and herbal medicines. Check back often at 58Coupons.com for the best savings, promotions and coupons for HerbsPro.com. Get free shipping from HerbsPro.com with your purchase over $89 or more and weighing less than 3 lbs. Click link to shop. Check out the Clearance Sale at HerbsPro.com and find savings up to 75% off retail prices. Enjoy 20% savings on orders over $200 from HerbsPro when you use this code at checkout. Click link to get started. Check out HerbsPro.com today and get a 5% discount on brands of the month with this coupon code. Save an additional 5% on facial care products from HerbsPro.com with this coupon code.